Here is swatch 2. I liked this one, had to learn how to do a Tunisian Purl....very cool! 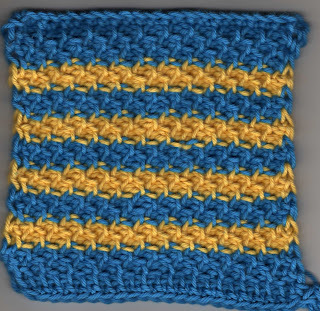 I've decided that these swatches will be washcloths since I'm using a nice cotton. They are really good for that! On to the third, which is a bit more complicated! That's a great color combo, and I really like the texture. Is it anything like the afghan stitch? Man, you've been busy!! I just barely saw an article on this and here you are DOING it!! Yeesch!!! Looks great! Keep up the good work!! Sorry Sarah, didn't see your comment until now....I think that it is the same. I find it is a lot more complicated then I thought it would be...but fun to do. Wow, this looks awesome - what a very beautiful texture, and I sure like the colours too!